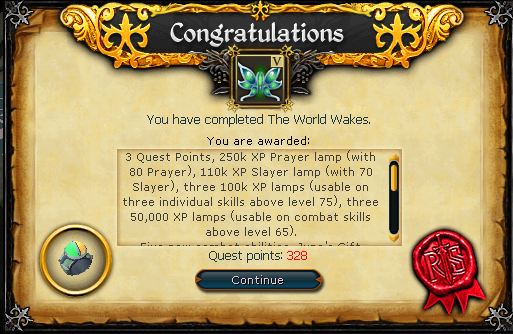 It’s a Grandmaster-level quest, centred on... the original resting place of Guthix. Sought by treasure hunters and historians alike for hundreds of years, its discovery will shake the very core of Gielinor. But how will you choose to progress through it? It’s packed full of choices and the path that you take will have world-shaking consequences. Huge amounts of history and the story of the Guardians of Guthix can be found, as well as direct contact with some of RuneScape’s most powerful characters. You can start this quest by heading west of the Legends’ Guild and speaking to Orlando Smith, an Indiana Jones-looking fellow who is located in a digsite. He says he is on the verge of a great archaeological discovery related to Guthix and needs your help in opening some doors and possibly a little bit more. Accept the quest and Orlando will tell you to lead the way. Open the doors and you should find yourself in an underground room with plants. Orlando will be pleased by the discovery and tell you that you should take something home to prove this is something important. Investigate carvings, notes, etcetera and you should hear clicks. After three clicks you should see a doorway open. Investigate the Guthixian statue in the new room. Orlando will state that this statue, consisting of a butterfly, may be something worth taking. Orlando will attempt to take the statue but the statue will not budge. Decide to give it a shot yourself and something will go wrong. Strangely, another room will open. Orlando Smith will be even more pleased with the results. Ignoring the alarm, he decides to keep on moving forward and trying to gather as much evidence as possible for the Varrock Museum. Suddenly, three level 120 Automatons will come out of the walls. They believe you and/or Orlando Smith are Mahjarrat and will forbid further access into the temple. Despite your attempts to convince the automatons you are not Mahjarrat they will not believe you. They will kill Orlando Smith as he tries to reason with them. If you thought Smith was Mahjarrat, apparently you were wrong! The automatons will then turn their attention to you. The automatons all have no weakness but each one attacks with a different combat style. The tracer will attack with range, the guardian will attack with melee, and the generator will attack with magic. Each guardian will have a very powerful special attack in which it slams the ground and hits over 1,000 damage if you are in the vicinity of the guardian. Due to this, fighting the guardians with melee is very difficult. It is suggested you use some sort of long range attack and go after the guardian first. Run around the room firing shots at the guardian while trying to stay away from all three automatons. Once the guardian is dead you can kill the other two automatons fairly easily if you stay out of stomping range. You can also block the automatons behind the trees or another automaton. Once you have killed the three automatons you will be greeted by a shadowy figure. The figure will state he has lain undisturbed for thousands of years and has banished the gods. He will summon four harmless apparitions which slowly approach you with each click and then finally bring you right next to him. 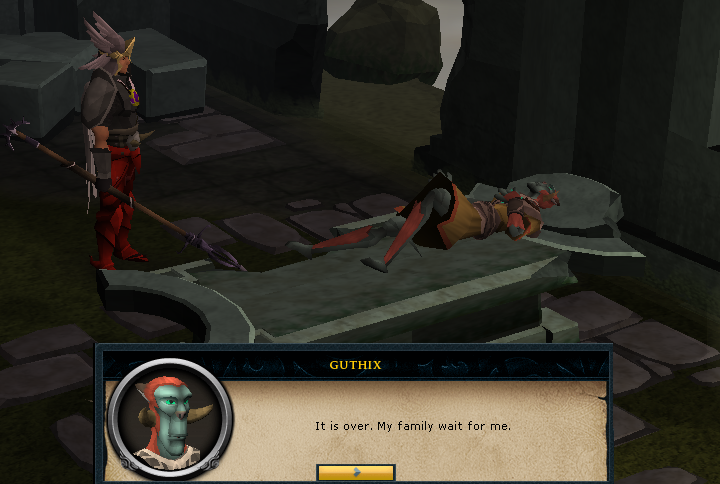 Question whether he is actually Guthix and he will reveal himself to be the Mahjarrat Sliske. Apparently he was the Mahjarrat the automatons were going after. He will reveal to you that the temple you are in is the temple Guthix is sleeping in. He will explain the Guthix's edicts and defense systems. Apparently all of the defense systems are connected to stone circles. When all of the stone circles were in Guthix's hands this proved to be an effective system. 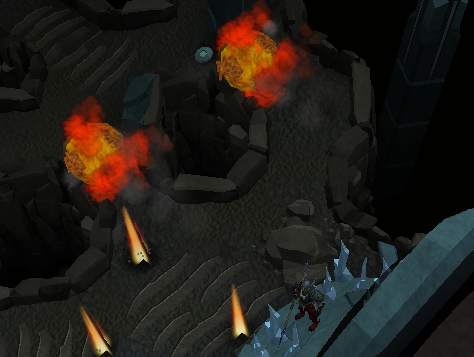 However, all of the stone circles are no longer controlled by Guthix causing his defence system to be somewhat flimsy. 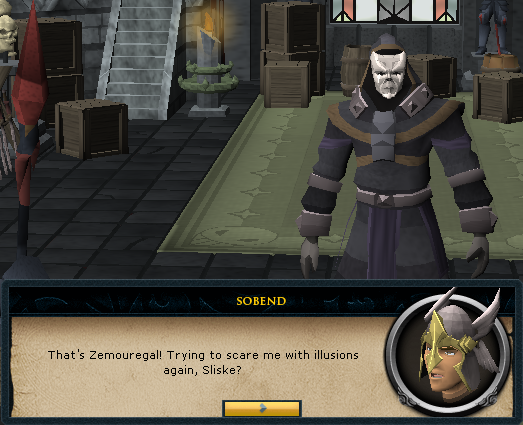 Sliske will then take you to Zemouregal's Fortress. You and Sliske will see Zemouregal greeted by Sharathteerk who bring wizards that will alert Zemouregal that the stone circle in Varrock was glowing, indicating someone has disturbed Guthix's refuge. Zemouregal will tell Sharathteerk to trace the signal to its source. Sliske will warn you that it will not take long for them to find the temple. He will then teleport you to the God Wars Dungeon. 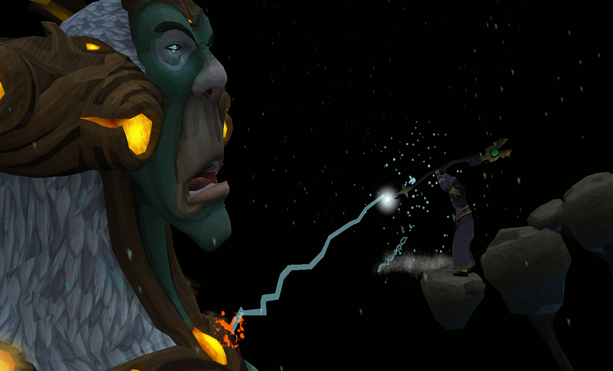 Sliske will tell you that the gods will be able to sense what is happening and will communicate with their followers. You will see Commander Zilyana escape. 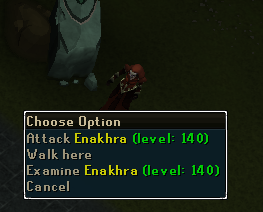 Sliske will then take you back to the Guthixian temple. He states that you, being the only one who can open the doors, will be recruited and threatened by followers of other gods. He will suggest you side with Guthix until you reach him because his followers are more likely to know about chamber than the followers of others. 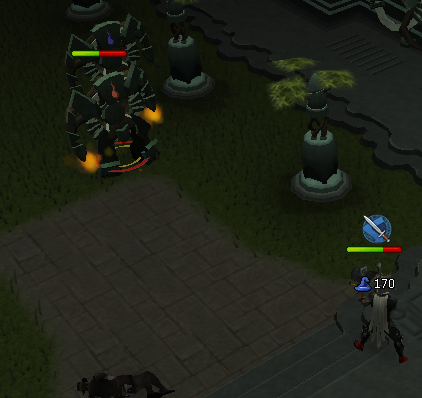 As he teleports out Kree'arra, Commander Zilyana and eventually K'ril Tsutsaroth will appear. Tsutsaroth will break down the door and run into the chamber. Angry, Zilyana will run after him and tell Kree'rra to deal with "the human." If you have not restocked since the last fight now may be a good time to do so. Kree'arra will ask you to leave but you will refuse. He will begin to attack. 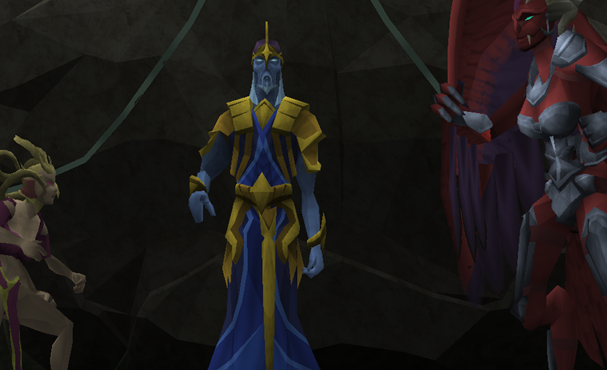 The Kree'arra here is similar to the Kree'arra in the God Wars Dungeon but a fair bit weaker. 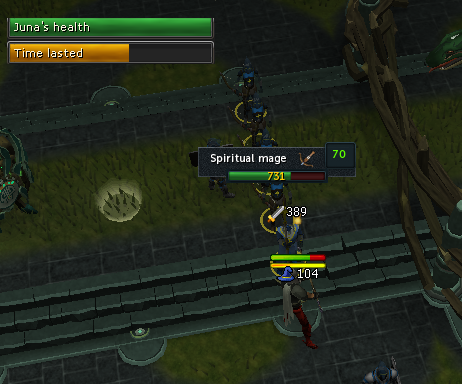 In the Dungeon, Kree'arra is normally killed with ranged. However, you can use any combat style for this battle as long as you are well-prepared. 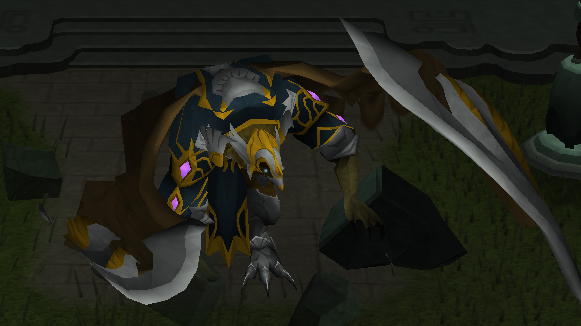 Kree'arra will summon storms of debris that will hit heavy damage if you are caught in them. Occasionally he will call the debris to him and send them out, in which case you should run around and try to avoid the debris. 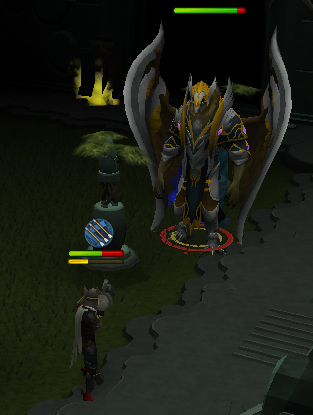 If you are ranging Kree'arra you can get him stuck behind a tree, which will prevent him from using his melee attack. Once Kree'arra is at 0 health he will fly away. 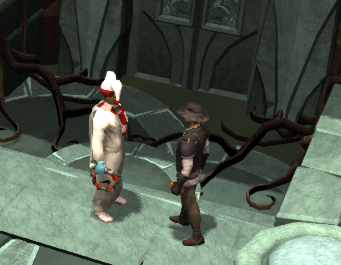 Head through the door and you should see Zilyana and Tsutsaroth stand by the door, unable to get it open. They will greet you and leave through the door you came in. To get past this next door you will have to solve a puzzle. Try to activate the panel and you will be greeted by numerous Guthixian followers. Death, who apparently is on the side of Guthix, will tell you to get away from the panel. However Juna from Tears of Guthix will recognize you and ask what you are doing here. Tell her anything and she will tell you that you must reach Guthix before anybody else. She will tell you to investigate the control panel. To open the door, you will have to solve the puzzle. The purpose of the puzzle is to roll a boulder (originating from one of the four corners of the puzzle) into a destination slot. The puzzle becomes more complicated when you consider that the position and function of some blocks changes with time. It's impossible to move one block to another part of the puzzle, but you can rotate each block 90 degrees with a click if it doesn't automatically do so already. This is a normal block. You can rotate it ninety degrees and it will not change position or function on its own. This is an auto-rotating pad. It will rotate ninety degrees every couple seconds. You can't rotate it ninety degrees, but that shouldn't be a problem because it does that on its own. This is a gated pad. It's like a normal pad, but it will stop the boulder when it rolls into the gate. To get the boulder moving again, click on the pad. This is a pressurized pad. It's like a normal pad, but it will rotate ninety degrees after the boulder rolls over it, but cannot be rotated by clicking on it. If the boulder is destroyed after it rolls over the pad, the pad will return to its previous position. This is a conveyor belt. The boulder can only move in the direction the arrows are pointing. You cannot rotate them, but that would not help you solve the puzzle anyway. They change direction once every two times auto-rotating pads rotate. This is a destination pad. The boulder can roll into this pad from any of the four cardinal directions. This pad is an active pad, meaning that your current goal is to roll the boulder into it. If the pad is inactive, meaning that it will be used later on in the puzzle, you cannot roll a boulder through it. If the pad is complete, meaning you have already put the boulder in here, you may roll a boulder over the pad. You can tell if it is active, inactive, or complete by its appearance and by right-clicking. Roll the boulder by clicking on the dispenser in the top right corner (not in this picture). The boulder will be stopped at the gate. Wait for the rotating pad to line up with the surrounding pads and release the boulder. Once the boulder reaches the next gate, you can release it immediately. The pressure pad will rotate ninety degrees after the boulder rolls over it, but in this puzzle that does not matter. Once the boulder reaches the gated pad, wait for the conveyor belts to move in the right direction and release it. Once the boulder reaches the next gated pad, wait for the rotating pad to line up with the puzzle like before and release the boulder; At the next gated pad, you can release the boulder immediately. The boulder will slide into the destination pad and a destination pad elsewhere in the puzzle will activate. Please note that the whole puzzle is not shown, only the area the boulder rolls on. Also note that even though the puzzle is in line in this picture, some cubes were constantly moving. 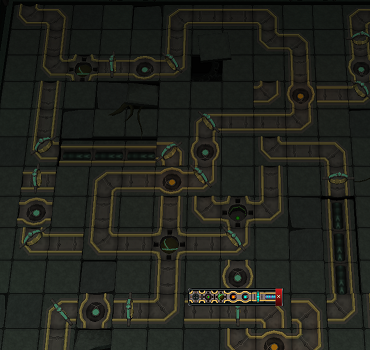 The interface that regretfully blocks your view in the solution to the first puzzle tells you the purpose of each pad and also can be used to exit the puzzle. Four boulders must be transported into the destination. Here the boulder has already been sent so they puzzle looks off. The boulder roll through the pressure pad that is now turned 90 degrees, through the already completed destination, through the second pressure pad that is also turned 90 degrees, over the conveyor belt (use the gate to release the boulder at the right time) and onto the destination. The boulder, which starts at the top left portion of the picture will roll through to the destination as long as you open the gates at the right time. The boulder will roll past the completed destination and past the pressure pad which will turn 90 degrees. It will continue along past the newly turned pressure pad, past the second already completed destination, over the conveyor belt and into the activated destination. When you have put all four boulders into their destinations the door will open. You and the Guthixians will continue through the dungeon until you find several more automatons and some unknown creatures. 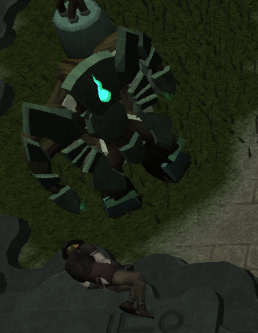 One of the unknown creatures will say he is a guardian of Guthix and state he has not seen another human since the God Wars. Juna and Fiara will remember the guardian and acknowledge the unknown creature's name as Cres. This will be a quiz to see where you lie in the balance of Chaos and Order and Good and Evil. You must try and balance the two comparisons. There are multiple ways of doing this. If you fail to achieve balance you will have to start over again. Once you have achieved balance Guthix will give you his blessing. Following that the ground will tremble as the invaders seem close to rush in. 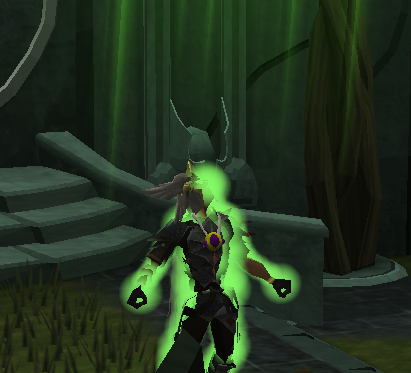 The followers of Guthix fear they are about to fight a losing battle until you take control of the situation. Enthuse the group, state the importance of protecting the edicts, and highlight the strengths of the group. The followers will be reinvigorated and energized. They will come up with a plan. Cres will suggest that you fight in the storage rooms as they are smaller rooms and this is where the invaders will first break in. You will split up into four groups to defend each wing. After doing this speak to Juna. She will state that she and several other followers will act as the last line of defense. Now you are ready to begin the fight. If you need to restock on food now is the time. 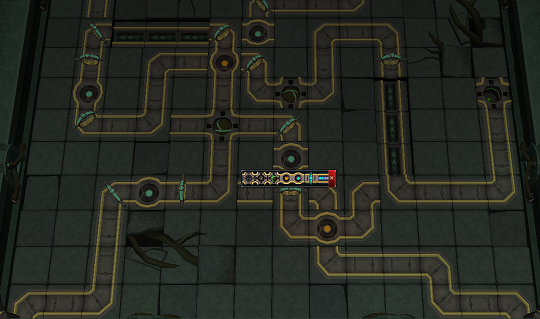 You can do this by banking at the Druidess in the main room. Also in the main room are three cauldrons, one which restores health, one which restores prayer, and another which buffs combat skills. The first wing you must enter is the second northernmost one. In the first wing you will find General Graardor and several of his minions. You must defeat Graardor while Chaeldar and Thaerisk Cemphier take care of the minions. Any combat style can be used here. Graardor has several special attacks. One involves Graardor smashing up the area in front of him. If this occurs you should try to avoid him until the special attack is complete. Another relatively harmless attack is where Graardor mindlessly attacks the area in front of him. 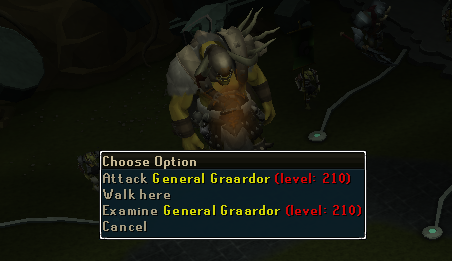 Graardor will constantly move forward and and you will have to move back with him if you wish to keep attacking. 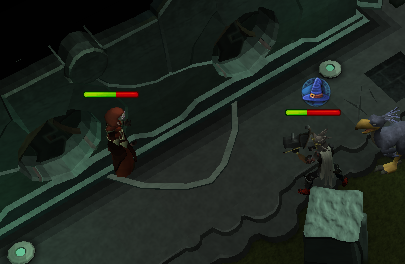 You can stop this special attack by backing into a corner, but if this happens Graardor may revert back to a defensive stage and deflect 100% of the damage dealt. When Graardor is defeated, like Kree'arra, he will leave the area instead of dying. When this happens you can leave the room even if Chaeldar and Thaerisk Cemphier are still fighting. Head out and you will discover the next wing broken into is the wing to the north of you. Bank, take a couple of sips from the cauldrons, and head into the storage room. Inside you will find Zemouregal. Zemouregal is a Mahjarrat seen earlier in the quest. He has no listed weakness but is strong against melee so it suggested you use ranged or magic attacks. Ranged attacks might be the best idea because Zemouregal mainly attacks with magic and ranged armor will help protect better against those attacks than magic armor. Zemouregal will summon dark portals. The first thing you should do is destroy these portals as he can bring extra minions in through it. Following that, Zemouregal will also summon decaying portals. These portals can hit steady amounts of magic damage if left undestroyed. Without these portals, Zemouregal is relatively harmless. About 1/3 of the way into the battle he will summon more dark portals that you will need to destroy. After destroying these it should be easy going as long as you keep the decaying portals at bay. 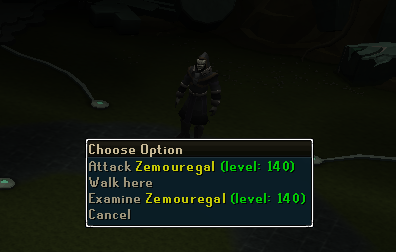 When he is at 0 health Zemouregal will give up and vow to see you again at Guthix's chamber. 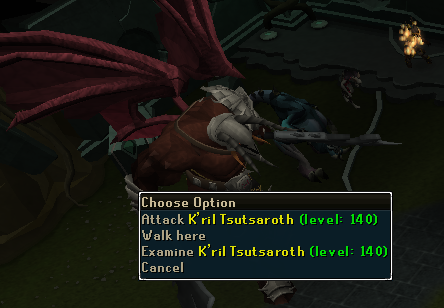 Head out and go into Death's chamber, where you will find K'ril Tsutsaroth. Tsutsaroth has three special attacks. One is where he swings his blade wildly. If this happens you should try to avoid him standing under him as he will inflict steady damage. Another attack involves him charging at you. You can tell when this happens by a warning in the chatbox. If you see this warning you should run to the side to avoid the attack. It can be hard to avoid all damage but on the plus side he damages himself when he runs into the wall. His last attack involves him slamming his blade into the ground. This also deals steady amounts of melee damage. Exit the room when you have killed Tsutsaroth and get ready to face your final opponent: Enakhra. Enakhra will spout out some ambitious diatribe and begin the battle. She is probably the easiest boss in the storage rooms but also the most time consuming. Enakhra has a special attack where she will leach some life out of you and use it to heal. The only way to deal with this is to run around an obstacle to interfere with the stream of leaching. Due to this attack it is suggested you use a range or magic attack over a melee one because you will be able to stay closer to obstacles. Position yourself near an obstacle as shown. When Enakhra begins to leach off of you quickly run around it to decrease the amount of times you are hit and the amount of times she heals. The amount Enakhra leaches off of you is based on your current life points, so keeping life points at a low but safe point is suggested. Later on she will also have an attack where she will freeze you (leaving you unable to move or eat) and then leach off of your health. Using the freedom ability to break yourself out of the attack is suggested. Once you kill her exit to the main room at Juna's request. 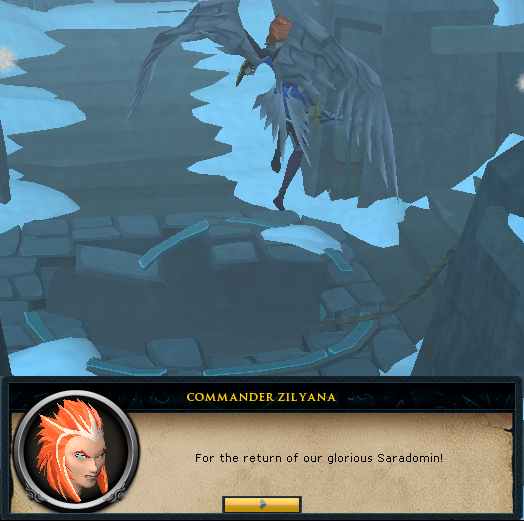 It appears that Commander Zilyana and her forces have made it to the main room! Speak to Cres who will tell you that the most important thing is to conceal the tableau that shows the path to Guthix. He says Zilyana knows of this tableau and is pushing towards it. He tells you he will take care of Zilyana while you protect the tableau from her forces. Talk to Juna and three portals will appear spawning level 70 Saradomin rangers, mages, and warriors. You will need to defend Juna from the forces. This should not be difficult. There is a barrier between Juna and the forces that can be repaired if necessary with no tools or materials required. Also, each fighter only has 1120 life points and will stop attacking the barrier or Juna once you have attacked them once. Using multi-target attacks (such as burst or barrage spells) would help with this although it should not be necessary. It is possible to line up the forces in a row to prevent from others from reaching the barrier. Once you have kept Juna alive for as long as necessary, a cutscene will play. Thinking Cres is Guthix, Zilyana will kill him. He will reveal that he is not actually Guthix before dying. Shortly after, Azzanadra and some other Zarosians will appear. Azzanadra will tell Zilyana to back down as she is outnumbered. Zilyana will refuse. Azzanadra will then tell Zilyana that he has an agent closer to Guthix and kindly asks you to lead the way to Guthix. Juna will be shocked at his statement and call it a lie. Azzanadra will laugh in her face saying that there was never any way you could have sided with Guthix. From here you will be given the choice of who you want to side with. You can choose whoever you want. Whether you side with him or not Azzanadra will tell you that the gates must be opened anyway. 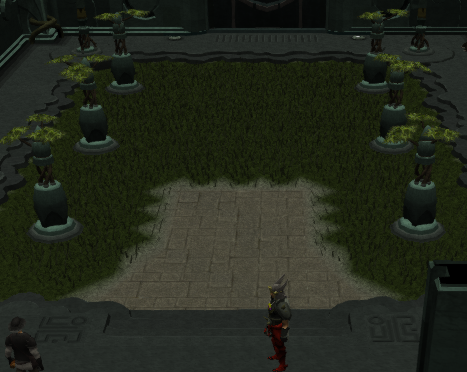 Suddenly the entrance to Guthix crumbles and opens up. Juna states that there already is somebody in the lair of Guthix and will tell you to check it out. Run past Juna and enter the shattered wall. You will now be in the chamber of Guthix. 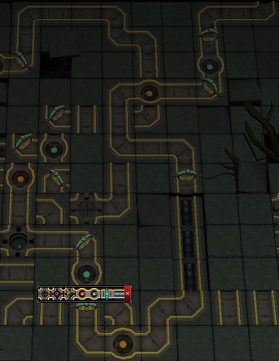 However, to get to Guthix himself you will have to run through obstacles along the way. For example, if you sided with Guthix you will have to face a fire show from Char, the main character in The Firemaker's Curse. If you randomly make a run for it you will likely suffer large amounts of damage. If necessary, run around the large fireballs and break the icicles that get in your way. 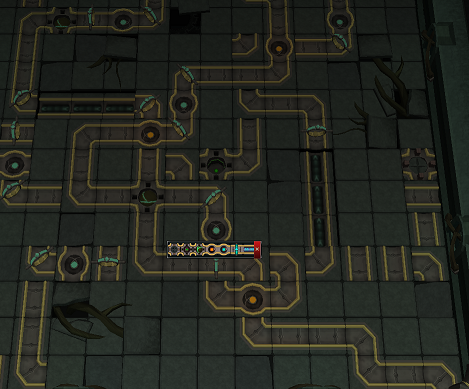 Eventually you should reach the chamber of Guthix. 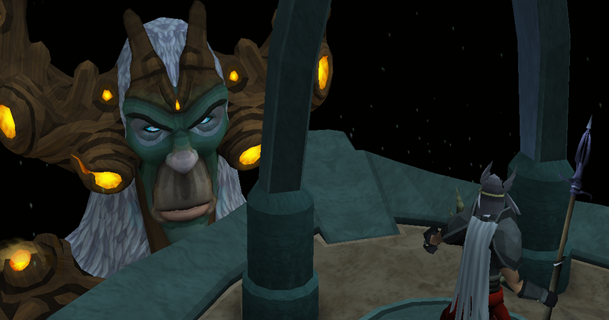 Shortly, Guthix himself will appear to you. Just as this happens, somebody will appear out of thin air and wound Guthix. After this happens Guthix will call you to him. Run down the stairs and climb on the ledge to Guthix. He will reveal that Sliske, the Majharrat who earlier assured you that Guthix would not be killed, has mortally wounded him. He thanks you for your attempted defense and will show you the memories of his homeland. He will disappear after telling you to explore. 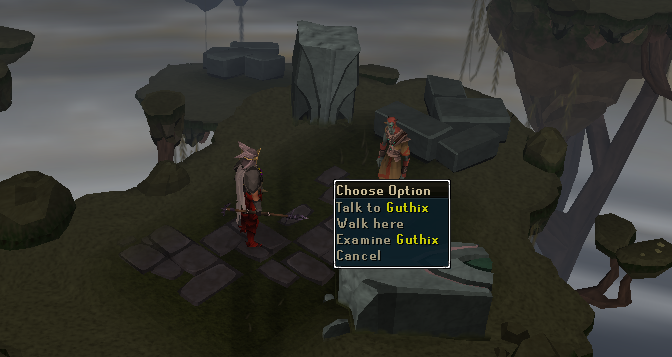 Walk around to a couple different platforms and Guthix will reappear. He will tell you that his homeland was always in turmoil because multiple gods claimed it as their own. The constant god wars eventually caused his people to be decimated and his world destroyed. Continue along the path, investigating the corpses if you so please, and come to Guthix again. He will show you the statue of a former god and tell you of his last days on his homeland. He states that as he was about to die he found a large magical sword. He realized that the sword was one of the elder weapons and realizing it was his only chance to survive he took it. He later used the weapon to kill the god shown in the statue and absorbed all of his energy, becoming a god himself. He took to Gielinor because it was beautiful and empty. There he found the Stone of Jas, which granted him even more power. Continue along the path and investigate the unidentified corpse. Guthix will go on to explain that he wanted to make Gielinor free of the influence of gods so he introduced only certain races he felt would not be inclined to a god. Keep heading north and speak to Guthix again. He said the mortal races he brought began to worship him, which he disliked. To avoid this, he fell into slumber, hoping to be forgotten. Soon after, however, other gods began to arrive. Guthix will later add that he could have easily prevented his own death. 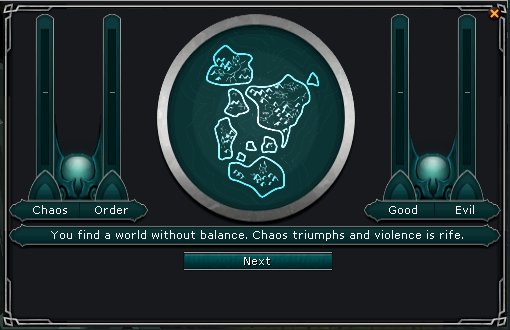 He states that he must die if the world is to be balanced. He says his death will also bring along the presence of other gods. However he will no longer be able to defend Gielinor from the wrath of the gods. He says only a mortal, someone who can fight the gods without the fear becoming one, can protect Gielinor from the gods. After he leaves his power with you, tell him anything and he will lie down and die. You will return and be greeted by the others. 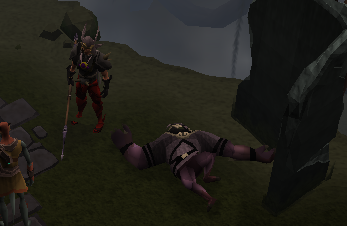 They will ask what has happened and you will tell them Sliske has killed Guthix. Everybody, including the Zarosians, are upset by this. Suddenly the first god will return to Gielinor. Speak to Saradomin. He will ask you for his opinion of him in which you can reply with anything. He will then ask you to leave as he has important things to do. He will attempt to teleport you out but fail. Intrigued, he will ask you if Guthix gave you any powers or wisdom before he died. You can reply with any option. He will then ask you what you will do with this power and again you can reply with any option. Saradomin will then teleport out. Speak to Juna to finish the quest. 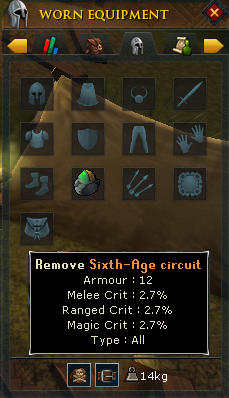 The sixth age circuit is one of the most powerful rings in the game. If lost it can be retrieved by talking to Guthixian high druid at the shrine of Guthix for free.